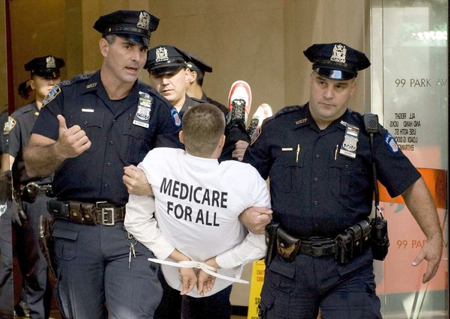 Over the past month, there have been 132 people arrested (and hundreds more in supporting protests) in 20 cities around the country, all demanding a single-payer healthcare system, or Medicare for All. I was in the first protest of this campaign in New York, on Sept. 29th, which was organized by the Private Health Insurance Must Go! (PHIMG) coalition, a NYC-based single-payer direct action group. 17 of us were arrested, and spent about 27 hours locked up. We got some national coverage, but it was clear that for this to be effective, it needed to grow. Since at least the fall of 2007, PHIMG has been organizing protests all around New York, targeting politicians and insurance companies, demanding single payer. Many of the members of PHIMG had gained political and organizing experience during the 1980s as members of ACT UP, and understood the importance of strategic civil disobedience tactics. With these veteran activists in the lead and momentum building for Sept. 29th, single-payer activists across the country began organizing a national campaign, coordinated by Mobilization for Health Care for All, and it’s main national member organization, Healthcare-Now!. The next action was in Chicago on Oct. 8th and continued with nationally coordinated protests on Oct. 15th in 9 cities (New York, Washington, D.C.; Cleveland; Phoenix; Palm Beach, Fla.; Boston; Reno, Nev.; Portland, Ore.; and Los Angeles), with 14 arrested in New York, 12 in LA and 11 in Boston. The latest wave of coordinated actions was last week, on Oct. 28th, with protests in 11 cities, including 37 arrested in Glendale, CA and 9 more in New York. Building pressure on congress through the media will help push the current proposals further left. Perhaps more importantly, however, these actions, specifically during this national debate, are important for solidifying the foundation for a stronger long-term movement for single-payer. So, while of course it’s exciting to be a part of a flashy, dramatic nationally coordinated campaign, we have to keep in mind the significance of these actions for the long-haul fight for single-payer. For those of us who are able to risk arrest, these activists are likely to be key folks for us to know going forward –- and there’s nothing like getting locked up together to jump-start a friendship! Check here for new upcoming actions. Actions are planned for Nov. 2nd, 4th, and 5th in 8 cities: St. Louis, San Diego, Albuquerque, Houston, Atlanta, Detroit, Syracuse, and Denver!